Minister of Youth, Sports and Culture the Hon. 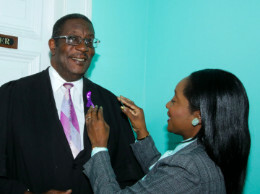 Lanisha Rolle pins a purple ribbon on Speaker of the House the Hon. Dewitt Halson Moultrie in honour of International Womens Day at the House of Assembly, Wednesday, March 6, 2019.